Foam was dispersed following the Fourth of July oil spill to prevent a fire hazard. The fuel station at Church’s Pier will remain closed after a Fourth of July gas leak. Oak Bluffs fire chief Peter Forend said that because of old fuel lines, the station at the Oak Bluffs harbor — the only source of fuel at the busy marina — will be closed until repairs are made. 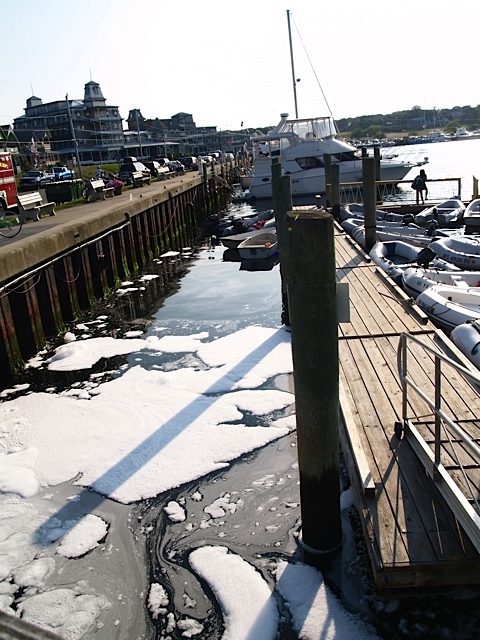 Firefighters responded July 4 to a small fuel leak that Mr. Forend said originated from a fuel holding tank at the dock; the chief estimated that 15 gallons leaked into the harbor. At the time, the fuel line was shut down and foam dispersed to prevent a fire hazard. Mr. Forend said he made the decision to keep the fuel station closed because “we don’t want to end up with any other issues.” The timeline for repairs was up to the fuel station owners, Mike and Mark Wallace, he said, adding that the owners have been cooperative. The Department of Environmental Protection has been on top of the issue, and a licensed site professional was hired to observe clean-up, which has been mostly completed, he said. Mr. Forend said the source of the problem seems to be older pipes that do not hold up as well to new ethanol gas. “Unfortunately, I don’t think there will be fuel on the harbor this season, but people and the environment will be safe,” selectmen chair Kathy Burton said Tuesday at the Oak Bluffs selectmen’s meeting. Most of Lake Tashmoo reopened for shellfishing last week after a diesel oil spill March 30. The Board of Harbor and Land Commissioners has sent to the legislature its report -for 1902.